I help my friend Camille find a lifestyle she could enjoy. Camille, 35, had been fighting her weight all her life. Obese she was not, but at 5’2” her extra 25 pounds were obvious; she felt and looked chubby. At one time or another, she had tried every diet to come along. In the end, by her own analysis, the problem was simply genetic: being overweight ran in the family. Her mother, in particular, had always been heavy. So deep down Camille believed her attempts to lose weight were doomed. Camille joined Clicquot when we acquired another firm; she brought some excellent business skills and experience. The corporate world, however, can be brutal and unfair, especially the luxury goods business, in which image is critical. In all corporations, appearance counts a lot more for women than for men. Camille’s job involved regular cross-country travel including dinners with clients. She’d been with us for a year when it became obvious that her first New York winter had not been an easy adjustment. Bulky cold-weather clothes had hidden some excesses, but once spring came around, I sensed a panic setting in, as the next round of heavy travel and entertaining loomed. We had developed a nice rapport and one day, when I asked her how it was going, she opened up to me. I told her about my own weight calamity as a young adult and how I was able to reverse it with some very simple changes. She agreed to record her consumption for three weeks. I don’t recommend jumping the gun, but it took only a glance at the very first week’s entries to spot some major offenders. First there was beer. It seems Camille “got thirsty” every evening, whether at home or out of town. So she would have a bottle of beer, often around 11 p.m. 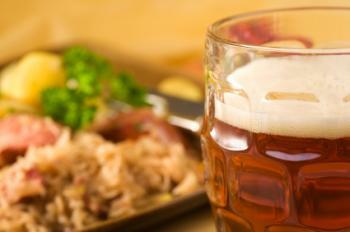 Drinking beer late at night seemed odd to me, especially in someone who was having wine with meals in restaurants. Could Camille have a drinking problem? No, her alcohol consumption wasn’t that excessive, and she gave no other indication. I asked how long this nightly beer thing had been going on. Apparently since college: she would buy salty snack foods from a machine while studying and wash them down at bedtime with a beer. Giving it some thought, she admitted she didn’t really love it; it was just a habit, she was just “thirsty.” It was clear she had unthinkingly imported an old college habit into her adult life and retained it for 15 years! Always one to try the obvious first, I said, “If you’re thirsty, why not drink water and then go to bed?” This seemed a no-brainer that could be worth between five to ten pounds over some months if she would just recognize and tame this one offender. But it wasn’t that easy. She wasn’t madly craving the buzz or flavor of beer, but she did want something more interesting than water. Surprisingly the solution for her was herbal teas. Her favorites became verbena and fresh mint, both soothing substitutes for the mildly sedative effect of bedtime beer. She was also eager to try new ones, and became rather a connoisseur of teas. It took her longer to embrace drinking more plain old water during the day—key to reducing night thirst. So I suggested she just make it a point of having a little paper cupful whenever she passed the cooler. When the effects began to show, she was passing it more regularly. Another problem came from business. Not only was she eating airplane food (sort of a contradiction in terms, really), but she was having it in addition to dinner on the town. It seems that whatever the flight attendants put in front of her—stale nuts, mystery meats, cloying desserts—she would eat it (know anyone like this? ), even with a business dinner or lunch scheduled shortly after landing. This was a relatively easy offender to banish. She knew that plane food was horrible. Was she eating out of boredom? To pass the time? Her third offender was a bit more complicated. A couple of times a week, especially on weekends, she would have a huge dish of pasta as her dinner. She said it seemed to her the easiest thing one could make and still have the comfort of home cooking. This was the voice of inexperience. Obviously, there were other ways of warding off the Sunday night blues. This problem called for a dramatic approach: no pasta at home for a while. But that meant finding things to cook that were equally satisfying and easy. As it was spring, the outdoor markets in New York City were a godsend. I showed her simple, delicious ways of cooking beets, fennel, broccoli and carrots with accents like chopped herbs and lemon juice. The flavors of fresh vegetables in season dazzled her. (Anyone who has ever had a real farm-fresh tomato will attest that with a little salt and olive oil, plus some chopped parsley or basil, that alone can seem like a meal. Making choices at her own pace, and to her own taste, she found it wonderfully easy to increase her fruits and vegetables. Following a simple recipe for fish—which, as a kitchen novice, she had never even attempted—she was enjoying at home a meal that would have seemed luxurious by most restaurant standards. She also found 20 minutes to walk each day (from the office after work, as she was not a morning person). She would ordinarily have had one transfer, but she took the subway to the transfer point and walked home from there. After three months she’d lost 10 pounds. On a small frame, it showed big time. And as she liked the changes she had made, she seemed in no imminent danger or gaining it back. In fact, she was eager to experiment with new ways of painlessly losing the rest. I noticed some new clothes, a self-confidence I had not seen before and a happier face. Others noticed too. To accessorize. The word “jouer” adds the sense of play to this activity.